In the last two months, there’s been a lot of buzz about what the biggest issue publishers will face in 2017 will be. The answer? The Facebook threat. Premium publishers like CNN, The New York Times, and Fox News are struggling to innovate at a fast enough rate to keep up with the Silicon Valley giant. And the issue is only getting worse. However, I’m here to tell you that publishers CAN succeed. Publishers can outpace Facebook and even give them a run for their money. In short, the answer is: innovation. Here are 10 ways publishers must innovate in 2017 if they are going to increase their traffic, grow their revenues, and stay competitive. 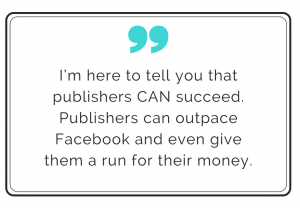 You heard it here first: publishers can outpace Facebook. What makes Facebook so damn addicting? Well there are a lot of factors such as a solid user experience, the network effect, and those little red notifications that trigger a dopamine hit every time they pop up on your screen. But even more than that, what Facebook really nails is their ability to create immersive experiences. Whether it’s Instant Articles, Instant Games, or Facebook 360 Video, everything Facebook builds is designed to keep users immersed, engaged, and addicted. And the social network will continue to spend countless hours building new features to immerse users and keep them on their platform (and off of your website). If publishers are going to keep up, they’ll need to find ways to offer the engaging and immersive experiences users crave. Surveys, games, quizzes, whatever it may be. Make sure it’s interactive. 2017 must be the year that content moves from static, to interactive. All of the top Silicon Valley companies are doing it, and it’s time for premium publishers to start doing it too. With programmatic buying as well as other technological innovations, online publishing is only getting more complicated. Having the best talent will be crucial if you are going to capitalize on the newest advancements in 2017. What it really comes down to is having the talent to adapt quickly and productively. Satty Bhens, Ling Lau, and Hugo Sarrazin, three top digital transformation experts, recently commented in the McKinsey Quarterly on the benefits of hiring top tech talent: “The top engineering talent can, for example, be anywhere from three to ten times more productive than average engineers, acquiring top talent can yield double-digit investment savings by accelerating the transformation process by even 20 to 30 percent.” The numbers speak for themselves. Facebook is pushing 360 video and for good reason. 360 video creates a far more immersive and engaging video environment than typical videos do. In short, they keep users spending even more time on Facebook. Sure, The New York Times and BBC are adapting to the trend, but there are so many major publishers failing to adapt. It’s time that more premium publishers catch up. Here, take a look at how The New York Times uses 360 video if you’re not convinced. And don’t just use 360 videos to report news, promote 360 video ads on your site. These ads are engaging and they can help increase both CTRs and CPMs. Mobile is going to continue to dominate in the coming years. In fact, the number of mobile phone users will grow to more than 5 billion in 2019. Facebook has adapted to this trend by prioritizing its mobile activities, building ads that are suited for mobile, and by designing its Instant Articles feature. How can publishers answer the Instant Articles challenge? There’s no way around it, premium publishers need to put a much larger investment in building mobile sites and apps that are responsive, quick loading, and optimized for user experience. Stop thinking desktop, and start thinking mobile. Eric Garcia, former Client Account Director at Fiksu, gave a great talk at the App Promotion Summit in Berlin about the importance of mobile and mobile data for publishers: “When we look at the devices shipped this past year, 9 out of 10 of them are mobile, and that’s only going to increase and become more important.” This is clearly something publishers must continue to take seriously. Not sure how to get started? Here are a few key starting points for optimizing your images: 1. Test the number of images on a page and determine how it affects engagement. 2. Test the angles your readers prefer, especially when it comes to products. 3. Reduce the file sizes of your images, it could drastically help with page loading times. On the monetization front, native ads that work well on desktop, mobile, and tablet will be particularly important this coming year. User experience will continue to be center stage in 2017 and intrusive ads such as popups and banner ads won’t cut it anymore. We recommend leveraging native ad formats such as In-Image advertising and content recommendation to enhance your user experience without sacrificing revenues. Clickbait may have been a solid strategy in 2010, but it’s not going to get you more readers or higher engagement in 2017. If your content isn’t quality and what readers are looking for, it’s only going to get more difficult to survive in today’s competitive online environment. Offer content that’s unique, contains a variety of visual elements, and speaks to your audience. Quality is the only real way publishers can outpace Facebook. What makes Facebook great? It’s highly personalized for each and every user. Every action a user takes, tailors the content they’ll see in the future. Premium publishers need to find new ways to personalize content for readers, whether it’s the images, articles, or ads they see. Don’t have the time to watch? Here’s my big takeaway from the video: Publishers must constantly think about ways to personalize content. At the end of the day, it’s about putting the right content in front of the right user. That’s the best way to increase your user engagement. The Facebook threat is only going to get worse in 2017, and publishers must work together to succeed. The social network will continue to keep your traffic hostage, monopolize ad revenues, and kill your reach. We wrote a piece about Artificial Intelligence, or AI for short, a few months back, but in 2017 this trend will be more crucial for publishers than ever. What does the future of online advertising look like? The answer: Ads that you can communicate with. You’ve been looking to travel in July and you see an ad for a hotel in Mexico that intrigues you. However, you have a few questions: Is there a casino? How much will a room cost? Is it near the beach? The ads of the future will answer your questions, immediately. Using AI, ads won’t just offer information, they will be a conversation. This is the direction that publishers must be heading. Sites where AI offer a personalized experience both in regards to content and monetization. Moreover, AI can massively help publishers to create more personalized websites and ad solutions. AI goes beyond the “a user read a business article and therefore wants to read another business article.” Instead, it looks at the bigger picture and serves content that users actually want to read. Jon Malach, CEO and Co-Founder of Native Ads says it best in an interview with PACEDm: “AI is the ability to predict and match content like a human being. It builds profiles of human beings based on what they read, and then looks for an opportunity to replicate those trends for higher relevancy scoring and more engagement with the sponsored content being served.” In short, 2017 should be the year publishers leverage AI technologies to better serve their readers and ultimately, outpace Facebook. In what ways do you believe publishers can outpace Facebook and truly innovate in 2017? Let us know in the comments!